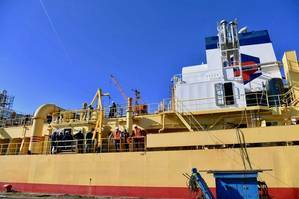 Europe's first conversion of a dredger to dual-fuel capability combining LNG and MGO is close to completion. Damen will deliver a turnkey package that included engineering, procurement and support. The previous propulsion system of Dragages-Ports' Samuel de Champlain was diesel-electric burning MGO, and so the contract included the change of generators to dual-fuel models and the installation of on board LNG storage facilities. As many LNG projects prove, this one too was complex and challenging, particularly with the decision to change the engine manufacturer once the project was already underway. "The Samuel de Champlain conversion has been the subject of much interest within the dredging industry and the maritime industry in general," says Fabien Guillemot, Commercial Manager at Damen Shiprepair Dunkerque. "LNG isn't new, of course, but this conversion of an existing vessel opens up new possibilities." Following her final commissioning the Samuel de Champlain will return to her regular duties of dredging the Loire and Seine rivers. The conversion has been part of an EU-supported initiative to promote LNG propulsion in short-sea vessels operating along the European Atlantic coast.